Above: Espy-Wilson's "Multi-Pitch Tracking in Adverse Environments" could improve comprehension where background noise interferes with a signal. 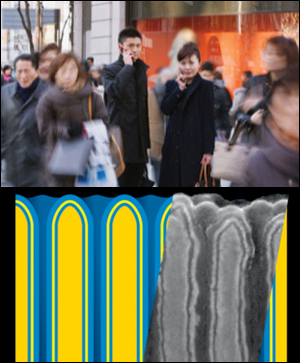 Below: Rubloff's “Nano Arrays for Energy Storage” may improve battery capacity tenfold. Professor Carol Espy-Wilson (ECE/ISR) and Maryland NanoCenter Director Gary W. Rubloff (MSE/ISR) have each won a University of Maryland “Invention of the Year” award. In the Information Science category, Espy-Wilson and her Ph.D. student Srikanth Vishnubhotla were recognized for "Multi-Pitch Tracking in Adverse Environments." This invention addresses a problem familiar to anyone who has used a cell phone in a public place: background noise. The novel algorithm "cleans up" speech by separating the voices of the primary speakers from their noisy environments. Espy-Wilson plans to develop the technology through her start-up company, OmniSpeech. The technology also can be used to improve sound quality in hearing aids, for military sniper and subject identification, and in teleconferencing. In the Physical Science category, Rubloff, along with Associate Professor Sang Bok Lee (ChemBiochem), and Rubloff’s Ph.D. student Parag Banerjee, won for their invention, "Nano Arrays for Energy Storage." This is a high-density energy storage solution for vehicle and electronic device batteries. The arrays have a capacity that is 10 times higher than available products and can be produced using inexpensive materials. Rubloff and Lee plan to start a company to bring the nano arrays to market. In 2007, Rubloff was a finalist in this same category for “Lateral Two-Terminal Nanotube Device and Method for their Formation.” The invention enhances the efficiency of energy capture, storage, and delivery. In addition, ISR-affiliated Assistant Professor Miao Yu (ME), Hyungdae Bae and Xuming Zhang were finalists for “Surface Mountable Ultra-Miniature Fiber-Optic Pressure Sensor.” This is a unique fiber-optic fabrication technique for the production of smaller, more sensitive pressure sensors. Such sensors are used for space-constrained medical diagnostics and for acoustic sensing.